The year’s biggest American sporting event, the Super Bowl, just wrapped, but we’re less than two weeks away from another big one: NASCAR‘s Daytona 500. The Daytona 500 is NASCAR’s most prestigious and well-known race, but unlike the Super Bowl, which wraps up the NFL season, the Daytona 500 is the first race of the NASCAR season. The race doesn’t decide the season’s champion but serves as a celebration of stock car racing at a time of the year when every driver is still in contention for a championship. 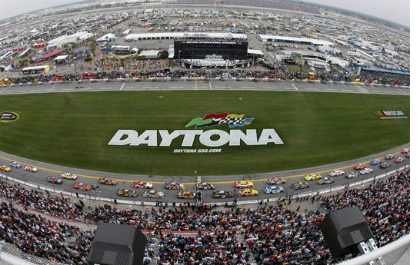 Thousands of racing fans flock to Daytona Beach for the 500 and other racing-related events each year, making it a good opportunity for advertisers to target them through out-of-home media in the market. To find out more about the out-of-home landscape in Daytona Beach, read on. This is one in a Media Life series on buying out-of-home markets. 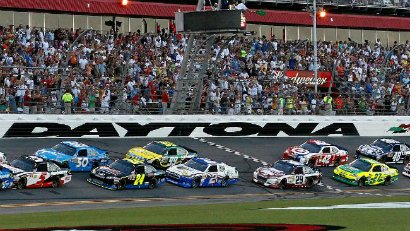 The Daytona 500 on Feb. 21 caps an eight-day celebration of racing in Daytona Beach known as Speedweek. The festivities kick off on Feb. 13 with a pair of races from the ARCA Racing Series, which serves as NASCAR’s minor leagues. Qualifying for the Daytona 500 begins on Feb. 14. On Feb. 18, NASCAR Sprint Cup drivers take part in the annual Can-Am Duel, a race that determines the rest of the starting grid for the Daytona 500. The following two days feature lower-tiered stock car races, including the NextEra Energy Resources 250 on Friday and the PowerShares QQQ 300 on Saturday. 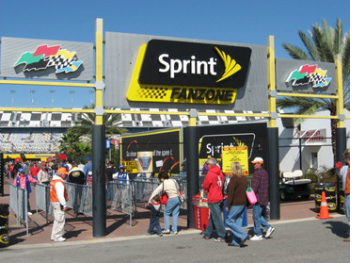 In addition to all of the races, Daytona International Speedway also hosts the Sprint Fanzone, a fan fest that includes sponsored attractions and events, such as driver appearance and live music. There are also other attractions such as a midway, a Budweiser-branded restaurant, and a shop that sells NASCAR memorabilia. All of these are open to sponsors, and the fan fest is a good place to set up booths and displays for sampling and to interact with fans. 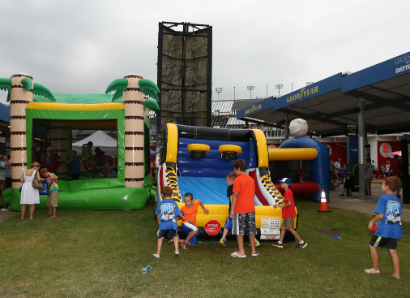 Advertisers can also use existing out-of-home inventory around Daytona Beach to target the thousands of fans in town for the racing events. Those options include transit such as bus and taxis, street furniture and airports. Another interesting and unique venue: Cruise ship terminals, where big ships from companies such as Carnival deport. 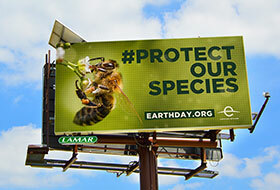 There are roughly 400 static billboards in Volusia County, as well as a small number of digital billboards. NASCAR doesn’t release officially attendance figures, but Daytona International Speedway seats just over 100,000, and thousands more attend the race in the infield. Another 13.4 million watched last year’s race on TV. Like other major markets, TAB ratings are used, while attendance for various Daytona 500-related events can be tracked. Some of the most common categories at the Daytona 500 include telecom, auto, car care, beer, fast food, soft drinks and retail. The median household income in the market is $43,973, and 57 percent of adults are college-educated. Meanwhile, the NASCAR fans who flood the market this time of year are 63 percent male and 37 percent female, and 45 percent are between ages 18 and 44. Typical lead time for OOH inventory is fairly standard, two to three weeks, although advertisers looking to secure inventory for the Daytona 500 typically do so months in advance. Pricing also varies widely, but billboards generally cost between $3,500 and $7,000 for a four-week campaign. Recent or current out-of-home advertisers in Daytona Beach include Budweiser, Gatorade, Sprint, Sunoco, Chevrolet, Toyota, Kroger, Lucas Oil, Comcast Xfinity, Rolex, McDonald’s and Coca-Cola. 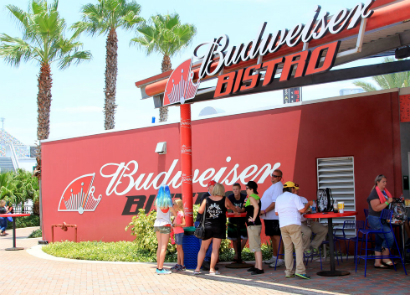 “As there are hundreds of thousands of fans that attend the Daytona 500 event, sampling is highly recommended with any type of experiential event. This puts the brand’s products directly into the consumer’s hands and will drive social media interaction and word of mouth.” — Tom Pirog, director of media at Billups.